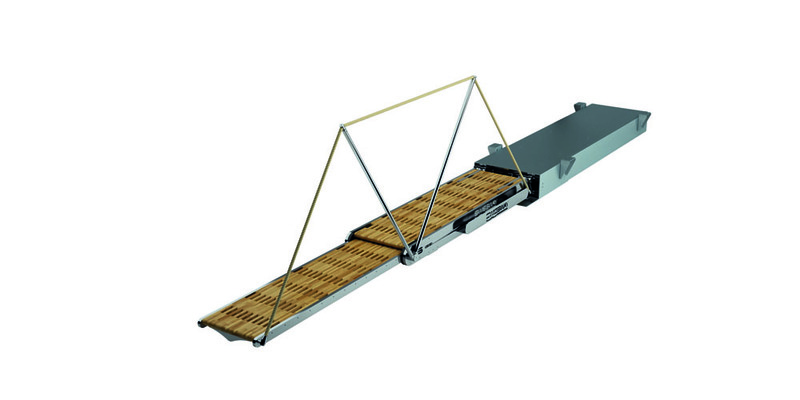 The retractable gangway Ballarin is the smallest fully automatic one-stage gangway driving from a box, intended for entering the yacht from the dock. Possibly customize the product to individual needs. 1500 1497 972 525 375 330 1432 455 156 150 KG. 1500+200 1697 1172 525 375 330 1632 455 156 150 KG. 1700 1697 1072 625 375 330 1532 455 156 150 KG. 1700+200 1897 1272 625 375 330 1732 455 156 150 KG. 1900 1897 1172 725 375 330 1632 455 156 150 KG. 1900+200 2097 1372 725 375 330 1832 459 162 150 KG. 2100 2097 1272 825 375 330 1732 459 162 150 KG. 2100+200 2297 1472 825 375 330 1932 459 162 150 KG. 2300 2297 1372 925 375 330 1832 459 162 150 KG. 2300+200 2497 1572 925 375 330 2032 459 162 150 KG. 2500 2497 1472 1025 375 330 1932 459 162 150 KG. 2500+200 2697 1672 1025 375 330 2132 459 162 150 KG. 3100 3097 1772 1325 375 330 2232 459 162 150 KG. 3100+200 3297 1972 1325 375 330 2432 459 162 150 KG.